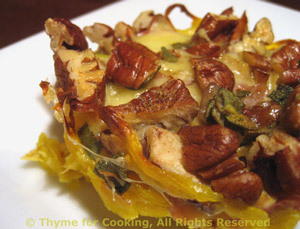 Butternut Squash Pecan Cups, Thyme for Cooking gourmet starter. These are a little fussy to get out of the ramekins but the combination of flavors (and showy presentation) is worth the effort. Butter, rather than oil, helps make it a bit easier. Line the ramekins with the shredded butternut squash, working it up the sides as best you can. Bake for 15 minutes at 375F (180C). Remove, drain on paper towels. Very roughly chop pecans - in half or thirds. Briefly sauté pecans in bacon fat, just until hot and starting to get golden. Crumble bacon and divided between ramekins. Add pecans, sage and cheese, dividing equally. Put a raw egg into each ramekin, on top of the filling. Bake for 10 - 15 minutes, depending on how you like your eggs.